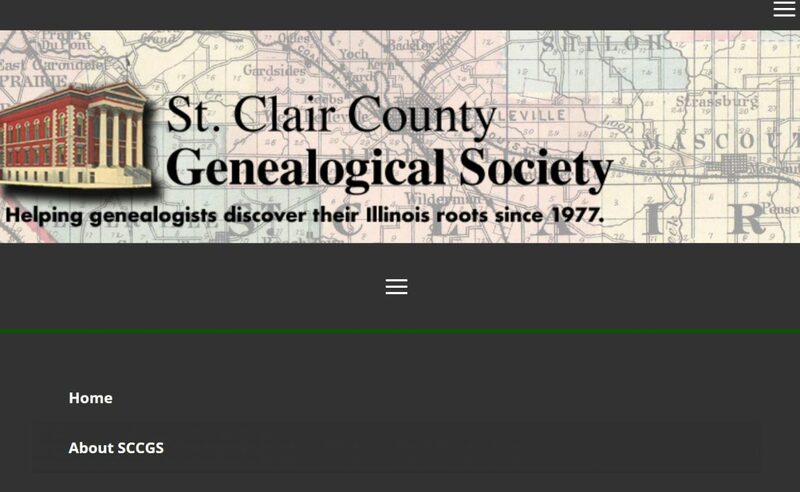 Best viewed on a desktop, the public website of the St. Clair County Genealogical Society began as a dozen pages in 1998. As of August 2018 it has grown to over 375 pages of indexes, transcriptions, finding-aids, and research tips. Click for viewing tips. the opportunity to sign up for email announcements to be sent about once a month. Unsubscribe at any time. We welcome website suggestions or corrections and invite you to join SCCGS, enjoy all the benefits including member site access, become involved, and grow with us. Toggles and tabs are used on some pages. Read about these at Search on the main menu above. The compact menu shown on below is commonly seen on phones, or sometimes on a desktop if the browser is set to show enlarged pages. To shrink the page so that the main menu appears across the full width of the browser, do this: On the keyboard, press and hold the Control key, then, with the mouse, scroll the wheel forward or backward until the window resizes and the main menu is fully visible (Home will be on the left, Search on the far right).